Two democrats running for governor in Maryland, from left, Rushern Baker, at an event in Baltimore, Feb. 11, 2018, and Ben Jealous, in Lanham, Md., April 1, 2017. His bellowing voice cutting through a mid-June evening in the diverse Washington D.C. suburb of Silver Spring, Maryland, Democratic gubernatorial candidate Ben Jealous did not hesitate to invoke President Trump and strike a national tone. "We are building a movement on Trump's doorstep to get rid of his doormat named Larry Hogan," said Jealous, former president of the National Association for the Advancement of Colored People, flanked on stage by Vermont Sen. Bernie Sanders, just one of the nationally prominent politicians who've boosted his campaign ahead of Tuesday's Democratic primary in Maryland. Sen. Bernie Sanders addresses a rally against the Republican tax plan outside the U.S. Capitol, Nov. 1, 2017 in Washington, D.C.
That Sanders, one of the most recognizable faces in American politics, stood beside Jealous that evening was no aberration, but rather another instance of the 45-year-old's calculation that consolidating local support within the state of Maryland will not be sufficient in securing victory over his main opponent, Prince George's County Executive Rushern Baker. "Let us all be very clear and very realistic that Ben is engaged in a very, very tough election. 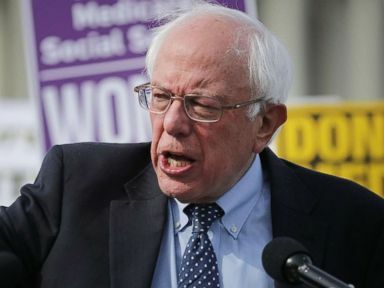 He is taking on the entire establishment of the state, and the likelihood is on election night the results are going to be very close," Sanders said introducing Jealous. For his part, Jealous seems to be relishing his role as the tip of the spear, fighting back against what he calls the Trump administration's "un-American" policies. "I was born into the resistance. I'm happy to lead it as the next governor of Maryland, and I'll be outspoken every time Trump attacks our values," Jealous told ABC News following the Silver Spring rally. 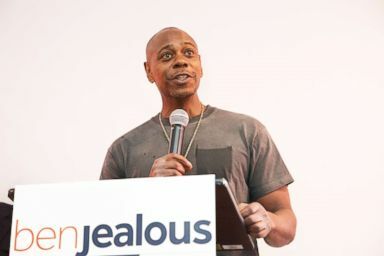 Dave Chappelle appears for Governor Candidate for Maryland Ben Jealous campaign event on June 8, 2018, in Largo, Md. 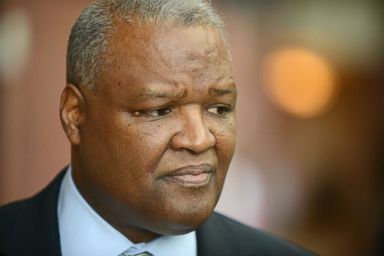 More than happy to demonstrate what he sees as his focus on local support over national figures, Baker, 59, touts endorsements from a bevy of prominent Maryland elected officials both past and present, including Sen. Chris Van Hollen, Rep. John Delaney, former Gov. Martin O'Malley and Valerie Ervin, the former chair of the Montgomery County Council and a longtime progressive activist who dropped out of the race last month to back Baker. Ervin went as far as to label Jealous a "carpetbagger" over the fact that some 900 small-dollar donations to Jealous' campaign came from residents of California, according to recent campaign finance filings. But the campaigns of Jealous and Baker, though they'd both dispute the narrative, demonstrate a strategic divide in how Democratic campaigns operate in the Trump era, and bring into focus a key question facing a party eager to wrest away control of not just governors' seats across the country but also the U.S. House and Senate. Ben Jealous, former NAACP chair, who is considering a running for governor of Maryland, is pictured in Lanham, Md., on April 1, 2017. Is harnessing the liberal discontent and anger of the so-called "resistance" the best way to build a "blue wave" to sweep Democrats into power, or will a premium on local support and the backing of prominent local figures prove more effective? The question is one Democratic primary voters have been indecisive on this cycle, rewarding progressive challengers like Idaho's Paulette Jordan, but spurning them for more establishment-type figures like Nevada's Steve Sisolak. The Democratic contest in Maryland will provide yet another data point and answer to that all-important question. 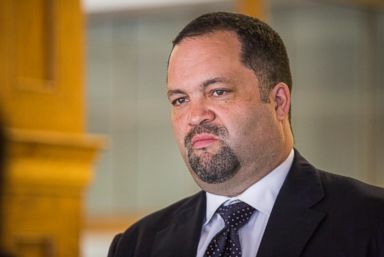 As the youngest-ever ex-president of the NAACP, Jealous had his time in the national spotlight in the five years he led one of the nation's most prominent organizations, while Baker has cut his teeth as the executive of Prince George's County, the state's second most populous, for more than eight years. PHOTO:Prince George's County Executive Rushern Baker arrives at National Harbor, Md., on April 7, 2017, to deliver a keynote speech at the National Association of Real Estate Brokers' 70th Mid-Winter Regional Conference. One of the nation's wealthiest African-American majority counties, Prince George's and the other counties that encompass the District of Columbia provide the base of Baker's political support, while Jealous' base lies in and around the city of Baltimore, where the NAACP is headquartered. Jealous' attempt to label Hogan, the state's incumbent Republican governor, as Trump's "doormat" is one salvo in a strategy Democratic candidates are employing against GOP opponents at all levels this cycle, and one that Baker is also not afraid to utilize while emphasizing the main difference he sees between himself and his opponent: his experience as an elected official. "We need someone who's actually pushed back against Trump at the local level," Baker told ABC News in an interview, adding that the race against Jealous is not a "progressive versus establishment" proxy battle, but rather a contest of "record versus rhetoric." Gov. Larry Hogan prepares to testify during a Senate Health, Education, Labor, and Pensions Committee hearing titled "The Opioid Crisis: Leadership and Innovation," in Washington, on March 8, 2018. "There's nothing more progressive than giving someone a job who didn't have it before," he added. "If you look at the record on those progressive issues they talk about, I've actually gotten things done on those issues." Jealous is quick to tout his campaign's emphasis on turning out a broad coalition of voters, and points to his choice of a running mate, former Maryland Democratic Party Chair Susie Turnbull, as evidence that his campaign is not solely fueled by national themes and well-known Democratic surrogates. "Hogan only wins if Democrats don't turn out," Jealous said, "My running mate, my campaign manager and I, the last time we were in charge of turning out voters in this state we succeeded against the odds in 2010, which was a bad year for Democrats across the country." When pressed on the most effective way to try and paint Hogan as a rubber-stamp for the Trump agenda, Baker gave Hogan credit for his decisions like the one he made this week to pull Maryland National Guard troops from the U.S. Mexico border over the Trump administration's zero-tolerance policy that led to the separation of immigrant children from their families, but said the bigger issue is not having a governor who is able to effectively lead the counter-Trump charge. 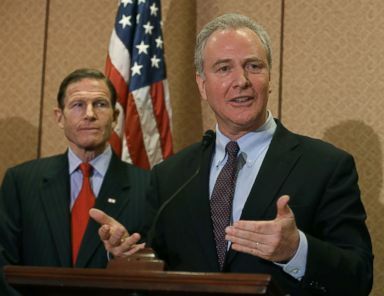 Rep. Chris Van Hollen, right, speaks about gun safety as Sen. Richard Blumenthal listens, during a news conference on Capitol Hill on Jan. 27, 2016, in Washington, D.C.
"You have to call Governor Hogan out on what he hasn't done," Baker said. "The Trump administration has set a dangerous tone ... from the very first day he was inaugurated. We expect a governor to be proactive and go out there and lead on these issues locally and nationally and remind people how Gov. Hogan's policies have allowed the things that we don't like about Donald Trump to seep in Maryland. Speaking to voters at Jealous' Silver Spring rally, it is clear that many see the endorsements from the likes of Sanders and Harris to be a sign that he is the true progressive in a race that includes not just him and Baker but former Barack Obama and Hillary Clinton technology adviser Alec Ross, attorney Jim Shea, state Sen. Richard Madaleno and Krishanti Vignarajah, former president of the Baltimore Teachers Union and one-time policy director to first lady Michelle Obama. 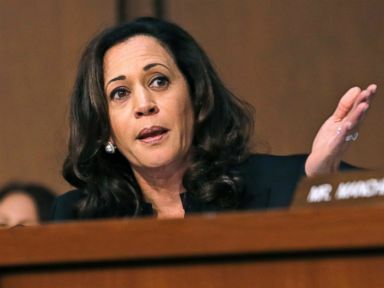 Sen. Kamala Harris is pictured during a Senate Intelligence Committee hearing about the Foreign Intelligence Surveillance Act, on Capitol Hill on June 7, 2017, in Washington, D.C.
"I'm not alone in thinking that if Bernie Sanders supports someone for governor or any position, that he or she shares the same progressive values that Bernie has. If he supports him, we definitely support him," said Andy Billotti, a voter from Frederick County, Maryland, north of Baltimore. Jane Schultz, a voter from Reisterstown, Maryland, a Baltimore suburb, said she liked Jealous' position on raising the minimum wage and was encouraged to see Sanders out on the stump in the campaign's final days. "I've been following Bernie Sanders since the election of 2016," Schultz added, "and I noticed that Ben Jealous was kind of in his side pocket. When he decided to run, I was like, That's the man." Schultz also said that the Democratic Party needs to do more to "get money of of politics" and push for a move toward a "Medicare for All" healthcare system. "I'm for stopping the 'Pay to Play' Prince George's political machine," said Jerome Dancis, an associate professor emeritus in the University of Maryland Mathematics Department. But despite the eagerness among progressives and the state party, the task of unseating Hogan remains an uphill battle for whoever wins. National Republicans are not sweating the results of Tuesday's primary. "Regardless of who Democrats nominate on Tuesday evening, Governor Hogan is in strong position for re-election this November," Jon Thompson, communications director for the Republican Governors Association, told ABC News. "Gov. Hogan is delivering results for Maryland, and he's working in a bipartisan fashion to do so. His campaign serves as a strong example of how Republicans can win and govern successfully, even in deep-blue states." 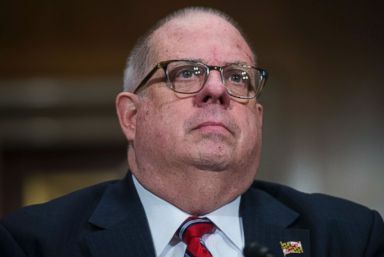 "Maryland voters are ready for a change and to elect a governor who will fight back against the dangerous policies coming out of the Trump White House," Democratic Governors Association press secretary Melissa Miller told ABC News. "Gov. Hogan has failed to stand up to Trump on issues that hurt Maryland families, like health care, immigration and the GOP tax scam. Hogan has spent the last four years like he’s spent his entire career: putting Republican political interests ahead of the interests of Maryland."